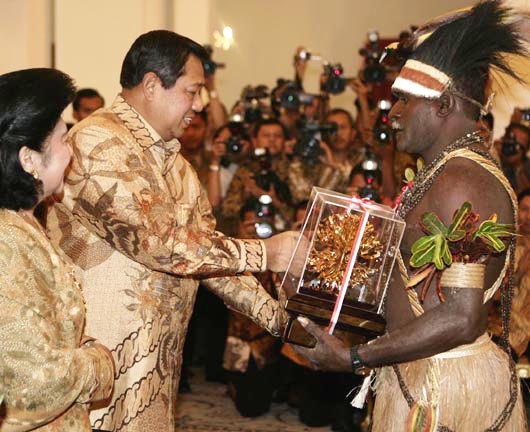 Amandus Yoliw Kaize, A Malind tribal chief from the Ezam group in Kaisa Village, Malind District, Merauke, wrote to President Joko Widodo on 18th April 2015 and sent Pusaka a copy in early June. The letter concerned a report of a land grab. In the letter, Amandus reported his problems with an oil palm plantation owned by PT Agrinusa Persada Mulia (APM), which had taken over 1000 hectares of customary land. He also reported that PT APM had cleared land belonging to the Malind and Yeinan people in Kolam, Wan and Bupul vllages (in Muting and Elikobel villages). “We’re extremely disappointed with this company’s activities in taking over the customary land. We are disappointed with the government which has never shown any concern for the people, even though we have made our contribution by looking after the forest and environment in Kaiza village to ensure it is protected”, said Amandus. Eight years ago, Amandus Yoliw Kaize was awarded the Kalpataru prize for environmental pioneers for his work in conserving indigenous forest. President SBY handed over the Kalpataru prise to Amandus and 83 others in the State Palace on World Environment Day, 5th June 2007. In his address, President SBY said how important it was to save the environment for today’s generation and for future generations and to increase our concern for the environment. In practice, customary forests which are important places for the Marind people are under threat or being destroyed by oil palm plantations and the rest of the MIFEE project. In his letter, Amandus asked the Indonesian President to pay attention to the Kalpataru. “We request and hope that the President of the Republic of Indonesia will instruct the relevant ministers, the Governor of Papua Province and the Bupati of Merauke Regency to address this problem. We hope that the government, especially the Environment and Forestry Ministry will form a study team to come to Kaisa village, which was awarded the Kalpataru”, Amandus asked in his letter. Amandus also requested that the Environment and Forestry Ministry give some support by funding the costs of a nursery, planting and maintaining the land to support the sustainability of local indigenous people’s forest. Amandus has threatened that he will return the Kalpataru prize to the government in Jakarta, if their wishes are not taken on board. This entry was posted in Merauke News and tagged Bupul, Kaisa, Kolam, Land conflict, PT Agrinusa Persada Mulia, Wan. Bookmark the permalink. Comments are closed, but you can leave a trackback: Trackback URL.